One of the best things that happened with me and the blog, this year, was the IFBC or the International Food Bloggers Conference. It was not just for networking, there was a whole lot of learning involved from all the sessions and I began to see everything in a new light. I learnt so much more about food, photography, writing, the technicalities behind a successful blog and also got to know a lot more about some new and exciting products that are out there in the market. 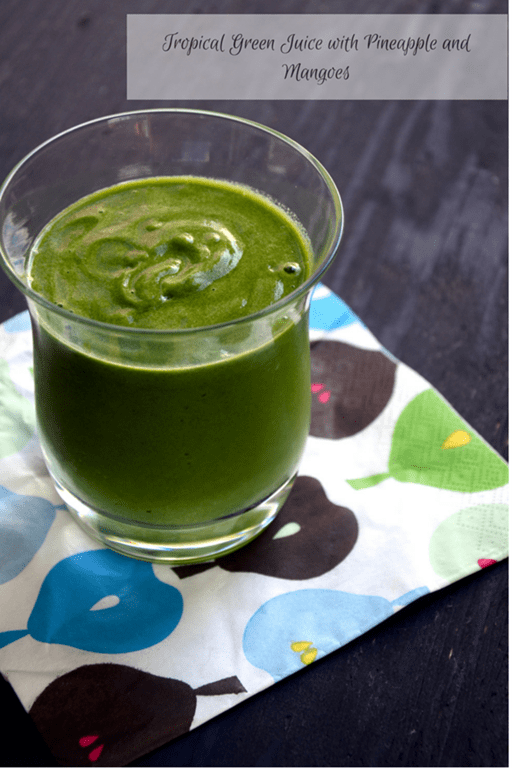 One such is the Nutri Ninja | Ninja Blender DUO with Auto-iQ. I mean, I always knew about Ninja. I have been in the market and researching for a new blender that was more than just a blender. My short lists were Vitamix, Nutri Ninja and BlendTec. I was still researching and deciding, when I sat in on the demo session during lunch time of day 2 of IFBC. Not only did the capabilities of Ninja blow my socks off but it also gave me a whole lot more information and frankly, nothing can beat a live demo about this blender and I was already leaning towards buying this. When I was contacted to try out the new Nutri Ninja, I was more than happy to do so as I wanted to check first hand, all the wonderful things I saw at IFBC. Christmas came a little early to the Mirch Masala kitchen and I now am a proud owner of the Nutri Ninja blender. I wasn’t sure what to make at first and just literally kept staring at my brand new blender for a couple of days and then I finally decided to break it in and made a Green Juice with Tropical fruits. I have juiced before with a juicer I borrowed from a friend but I felt that all the goodness in it was getting lost. The amount of fiber I threw away was just a lot to digest (pun intended ). That is when I started thinking of getting one of the high end blenders to help with my juicing but at the same time keep all the nutrients in as well. For this Tropical Green Juice, I threw in a cup each of kale and spinach and half a cup each of chopped pineapple and mangoes. 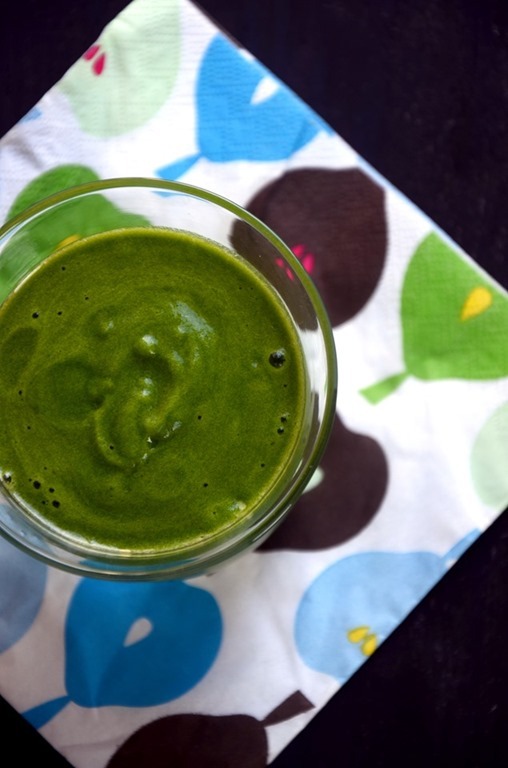 A stalk of celery, a teaspoon of flax seeds and a teaspoon of wheat germ made up for the rest of it. It was not one of those watery juices. It was thick and smooth at the same time. I could not feel a thread of fiber on my tongue but I knew it was there and that made it feel so much better. It also kept me full for much longer. I also made the Slow Cooker Butternut Squash and Chickpea Soup with Coconut Milk. It really was one of the smoothest soup I have ever had, that was homemade. And the best thing was that I did not have to check halfway through or adjust in between. I just had to put all the cooked ingredients in the blender jar and press the Auto-iQ button for Purees and it stopped and blended and stopped again and blended again until the timer on it ran out and when I opened it, there it was! – the soup of the perfect smooth consistency. Over time, I will have to find out which of these Auto-iQ settings will work for some of my Indian cooking sauces and mixes and once I do, I think my life is set for ever. Cleaning this is also such a breeze as the entire blade system comes out very easily and the base is very even with almost no ridges, so there is nothing stuck in between that you have to put some effort to clean out. That is a big plus in my book. Cons – It is a little on the noisier side compared to my Indian mixer. But it does get the work done faster, so I think I can put up with the noise for that little time. Overall, my kitchen and I are very happy to have this new addition and cant wait to see what else this can do! Disclaimer: I was contacted by Ninja Kitchen to write a review of their new product. 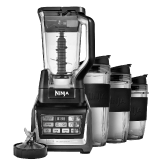 I was given the Nutri Ninja | NInja Blender DUO with Auto-iQ by the company to try it out before reviewing. However, the opinions are my own and have not been influenced in any way by anyone else. I also attended the International Food Bloggers Conference at a reduced rate in exchange of three blog posts about the conference or their sponsors. All opinions are mine and mine only.